When Thomas wakes up in a lift being hoisted up, the only thing he can remember about himself is his first name. He finds himself surrounded by boys that look about his same age, all of which also had their memories wiped. He is in the Glade, a place that is in the center of a huge maze. Before Thomas came, the boys worked in harmony for two years, each boy being assigned a job to do, trying to solve the maze in order to escape. However, the maze seems unsolvable. The day after Thomas came, an unconscious girl comes to the Glade by lift, the first girl to ever come. She delivers a message, saying that she is the last newcomer. Thomas struggles to become a Runner, one of the boys that runs through the maze and tries to solve it. After spending the night in the maze (since the doors to it close every night) and saving Minho, who is a Runner, and Alby, who is the leader of all the boys, from mutant half-robotic animals called Grievers, he becomes a Runner. As he trains, he realizes that unnatural phenomenon are occurring around the Glade. Thomas finds out that things are not always what you think they are, and needs to uncover the mystery on the whole Maze, and his memories. 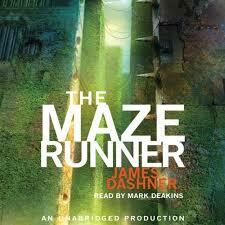 The Maze Runner is an excellent book. The story followed me long after I put the book down. You can imagine exactly what is happening and how the main character is feeling. My favorite part was when they all went out of the maze, and found out what happened that made them go in the maze with their memories wiped in the first place. The book is action packed and suspenseful, and I hope to read the three sequels that come after this book. I give this book a 9 out of 10, and recommend it to teenagers 12 and older to read. Who gave Thomas the tour on his second day? What message did the girl deliver when she arrived at the Glade? What was the name of Thomas’s attacker, and what caused him to stop attacking? Who is Minho, and what did he find in the Maze? Why did Thomas enter the Maze when he wasn’t supposed to? What did Thomas find in the Maze? Who is going through the Changing? What is going to happen the next day? What did Minho suggest they do to Thomas? Who lashes out at Thomas? What is on the page when they compare maps? What do the signs that are everywhere say? What are the six words used for the code? Why is the last code unable to be typed?